Recommended for all Windham Baseball and Softball players ages 6-14!! Windham Parents/Coaches - receive a $40 discount by assisting us on the floor this winter! 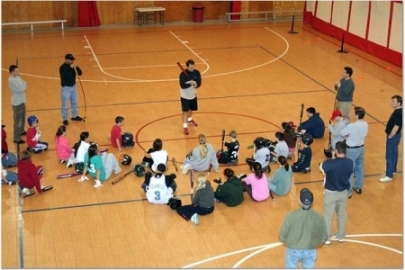 Many in town are familiar with the Windham Hitting Academy, which over the past 16 years has instructed well over 1,000 Windham young hitters. The Academy’s longevity is due to unyielding focus on teaching solid fundamentals and burning them into muscle memory. While having a lot of fun at it! There’s real science to the good swing and it’s much easier to teach than most people think. In fact, because of hitting’s nature, simpler is better. Hitting is all about the hands – it’s about hand path and speed by the time we’re playing in High School and above. The Hitting Academy focuses exclusively on these through supervised stations and plenty of swings (some weeks we get close to 100). Along the way, we focus on quieting the hitter’s mind – to not think about mechanics or timing but to focus 100% on seeing the ball and striking it. And feeling confident. For the new player, The Hitting Academy provides a solid mechanical (and mental) foundation on which to grow. For the experienced player, it provides the opportunity to fine tune the swing and get a ton of swings in every workout. I’ve been fortunate to do a lot of work with hitters and coaches at every level and am absolutely awed by the commonalities – the things that bring success are universal regardless of age. While several of my former players have gone on to play professional baseball, I experience more joy through my work at the youth level. … William had a great experience last summer with the hitting academy. He learned so much and had a fun at the same time. Jim Bail has been a great influence on our son and his knowledge of baseball has helped William a great deal. I recommend the Windham Hitting Academy to everyone. … Just thought that you'd be proud to know that your batting instruction at your hitting academy has really paid off for my sons. Last night my oldest son hit 2 homeruns at last night’s playoff game. He first hit a 2 run homerun that hit the fence on the fly. His next time up at bat he hit another fly ball that hit the ground just ~5 feet before the fence. This was a single run homerun. He had a hit each time up to bat. …You have the magic touch. Carter is excited and won’t stop talking about what he’s learning! Thanks, Jim! … Chris had a great season! In his last at bat of his last game he hit an in-the-park home run that hit the fence on the fly. What a way to end the season! We were all so excited and happy for him! What a confidence booster! And it's all because of you! You taught them the skills they needed to be better ball players. They love playing the game and we love watching them play! … Thanks soooo much!! You really made a difference for our boys. We’re watching for next year’s enrollment date.